During FABTECH 2018 in Atlanta, Michael Sharpe, business development manager for Fanuc America Corp., took time to explain the features and capabilities of the Arc Mate 100id while the arc-welding robot did its thing. 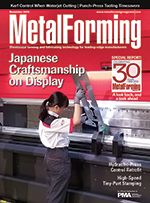 The February issue of MetalForming will include a FABTECH wrapup describing the many innovations uncovered by our editors. a staggering 2800-percent increase since 2010, and equaling 90 percent of the 189,000 total manufacturing jobs added in 2017. This brought the number of jobs returned to more than 500,000 since 2010. With at least half of these jobs believed to be at various levels of the supply chain, opportunities are great for metalformers. The November 2018 Precision Metalforming Association Business Conditions Report shows an increase in the number of metalforming companies forecasting a decline in business conditions during the next three months. Steel and aluminum tariffs could be the reasons why. Global Shop Solutions, provider of ERP software for small to medium-sized manufacturers, sponsored its second room makeover in partnership with Sunshine Spaces, a nonprofit organization based in the Dallas/Fort Worth, TX, that designs dream rooms for children battling long-term and terminal illnesses. Eliminate mechanical design mistakes by running your die in a virtual tryout press. SolidWorks and other 3D design software can check for interferences between parts in the position they were designed in, but only Logopress3 has the ability to quickly define the complex motions of cams, pads, transfer systems, etc, and then check for interferences between these moving parts as the material feeds and the press cycles. Can be done at any time once your tool assembly is saved. The U.S. Department of Labor’s Office of Apprenticeship has approved its first-ever, industry-vetted Additive Manufacturing Technician Registered Apprenticeship. The announcement coincided with National Apprenticeship Week, observed November 12–18, 2018. Looking to Step Up Your Training Efforts? Then check out the Precision Metalforming Association’s online learning environment, METALFORM EDU and its 500-plus courses. Kick off 2019 with a must-attend, info-packed event, the Metal Stamping and Tool & Die Conference, January 29-30 at the Nashville (TN) Airport Marriott. Presented by the Precision Metalforming Association in association with MetalForming magazine, the conference features keynote presentations, educational breakout sessions for stamping and tool and die, exhibits and a networking reception for more than 200 attendees and sponsors. Track sessions feature new, emerging, evolving and maturing technologies and industry trends that are impactful to metal-stamping, die-design and die-construction companies. February 12-13, Lubrication Technology for Metalformers, Hyatt Regency, Schaumburg (Chicago), IL. This conference, powered by MetalForming magazine with support from the Society of Tribologists and Lubrication Engineers, will update stampers and die shops on new lubricants for stamping and tool and die machining, and help them evaluate new formulations and select the right lubricant for the job. 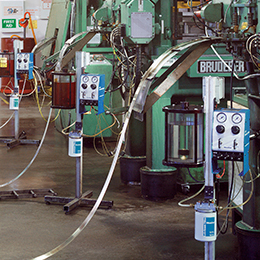 Attendees also will come away with an understanding of the various techniques available for applying lubricant, to ensure optimum application while minimizing waste. 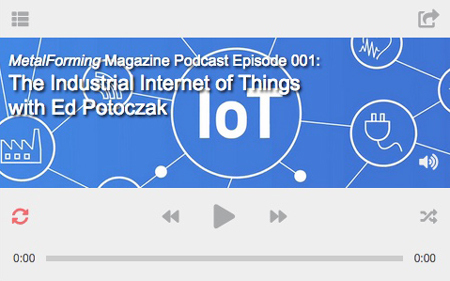 A look back and a look ahead as metalforming and fabricating technologies advance. Whether working on a new press or retrofitting a control system to an old press, success often rides on the capabilities of the motion controller.